As the Middle School Coordinator with an undergraduate degree in Christian Scriptures, I have the wonderful privilege of combining my gifts, passions, education, and interests with my deep love of scripture to set the curriculum for youth group and Sunday school. We began the Sunday School year going through a long series on the Bible. I would teach them how to observe, exegete, and interpret scripture and then we would close our Bibles and forget all about the text as we walked over to Safeway for our longstanding tradition of getting doughnuts together. I realized that I was teaching a theology that was not connected to daily need for theological justice. More than a month before the tragedy in Paris and the resulting public outcry against refugees, I began a project with the middle schoolers about the Syrian refugee crisis. As good theologians, we started with scripture. They each read a passage about caring for the foreigner and we began to brainstorm what we might be able to do. As teenagers, they cannot vote and have very little political agency. Often times that means that adults forget about their power and they begin to believe they have none. We admitted that the voices of Hate and Fear may be loud, but if that is the case then our voices of Love must be louder. Together, the students created a project with elements of advocacy, awareness and fundraising for Syrian refugees. 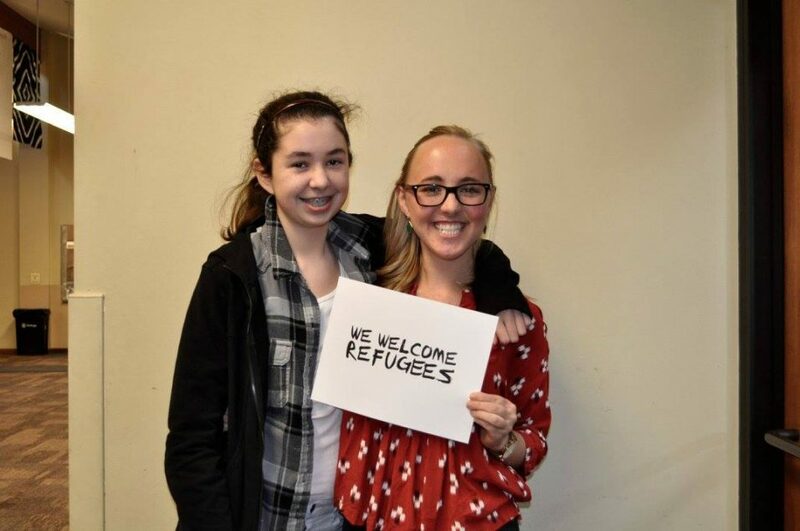 For months in Sunday School, Bethany’s middle school students learned about the refugee crisis, made a fundraising goal, decorated signs that said “Refugees Welcome”, and wrote letters to elected representatives. Based on their foundation in the love of God, our middle schoolers began to use their voices for justice. We had the opportunity to involve the congregation in our endeavors this December during Holiday Magic and at the Christmas Reception. The students worked hard to put together a station with letter writing to elected representatives, a donation box for World Vision, and a photo booth. There, people were able to take pictures with signs about welcoming refugees that were later uploaded to the Bethany Facebook page. As anyone who has used social media in the last few months could tell you, the voices of Hate and Fear are loud. Even many Christians have given in to this fear and perpetuate it daily. Even if we disagree, we eventually become what we consume and we consume a great deal of Fear. Our pictures are affirmations of the dignity of all human beings, particularly Syrians who are fleeing for their very lives. By adding our small and humble voices to the cacophony of sounds, we slowly change the conversation. We add fuel to the fire of Hope instead. I’m writing this during Advent, which feels absolutely fitting. We’re in a season of waiting—waiting for the Hope of All Nations. We’re waiting for our Savior, the one who comes not as warrior or extravagant ruler, but as a humble infant. We’re waiting for one who will tell us that in order to be strong, we must be weak. Who tells us that the Kingdom of God we’re so desperately waiting for is like a tiny mustard seed or grain of yeast. Our middle school students are leading Bethany in the ways of justice and mercy; may we be bold enough to follow.